From Interstate 15 at Provo, Utah, north to U.S. 40 at Heber City, Utah. From the Utah State Line southwest of Evanston north to Broadway Street in Jackson. U.S. 189 is not signed between Heber City and the Utah State Line near Evanston. There is an end shield for U.S. 89 posted in Heber City, Utah at the junction with U.S. 40, illustrating that UDOT considers its portion of U.S. 189 as distinctly separate from Wyoming. U.S. 189 follows Interstate 80 from the Utah State Line to the Kemmerer Interchange, State Control Route 11 from the Kemmerer Interchange to U.S. 191 (Daniel Junction), State Control Route 13 from Daniel Junction to U.S. 26-89 (Hoback Junction), and State Control Route 10 from Hoback Junction to Yellowstone National Park. In Evanston, the U.S. 189 business route parallels Business Loop Interstate 80 through that city. 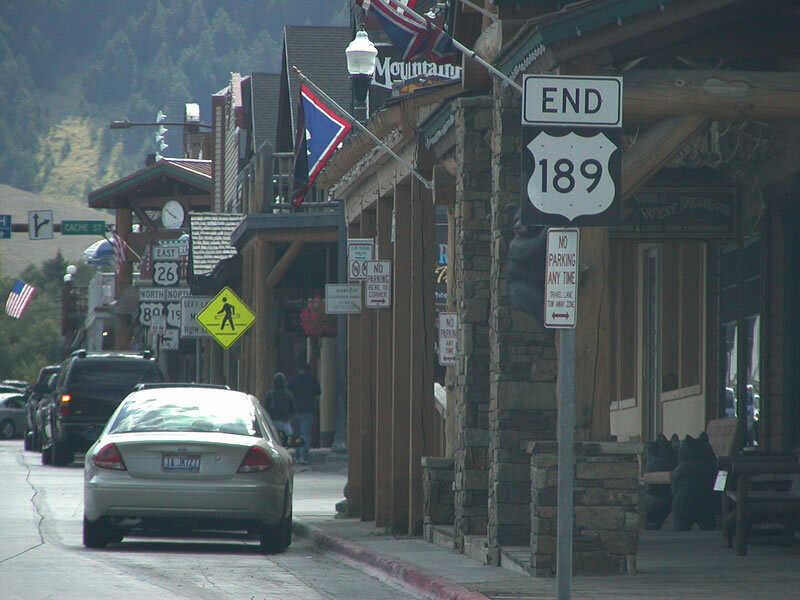 A short Spur U.S. 189 extends from the eastern end of this business route to connect to Bear River State Park just south of Interstate 80 (Exit 6). U.S. 189 was not an original 1926 U.S. route. Instead, it was commissioned thirteen years later, in 1939. Between 1926 and 1939, U.S. 189 was a short connector route between U.S. 91 at Nephi and U.S. 89 at Ephraim in central Utah. Today this old definition of U.S. 189 is known as Utah 132. In 1939, U.S. 189 was moved from this routing in central Utah to its present routing, from U.S. 89-91 in Provo, Utah, north to Jackson, Wyoming. U.S. 189 absorbed old Utah 7 (between Provo, Utah, and Heber City) and U.S. 530 (between Kimball Junction and Echo Junction along Interstate 80). Then it merged with old U.S. 30S until near the site Piedmont, Wyoming. There U.S. 189 turned north on its own toward Kemmerer, Big Piney, and Jackson, via old Wyoming 287. Once U.S. 530 was decommissioned and U.S. 189 was created, old Utah 35 was recommissioned as Alternate U.S. 189 in Utah. This routing lasted until the 1970s, when U.S. 189 was realigned to the old U.S. 189A route. Then, in 1992, the U.S. 189 signs were taken down from this road, and U.S. 189 became Utah 32. The interesting thing about this routing of U.S. 189 is that Wyoming highway planners wanted this road to be U.S. 89. If you look at the original grid pattern, if U.S. 89 followed the U.S. 189 routing through southwest Wyoming, it would be just about equidistant from U.S. 91 in the Salt Lake Valley and old U.S. 87 in Rawlins. However, it was not to be: U.S. 87 was skewed closer to U.S. 87 and U.S. 89 was skewed closer to U.S. 91. For one year (1938), modern-day U.S. 189 was known as U.S. 89T, or temporary U.S. 89. See the U.S. 89 listing for more on the early history of that route. I think the reason why Wyo. 89 exists is because Wyoming was angry that it didn't get U.S. 89 routed through Evanston. Giving a primary state route and a U.S. route the same numbers that close to each other is ridiculous, and it confuses the traveler. (Look at the U.S. 95 and Arizona 95 situation near Lake Havasu: same problem). More recently, U.S. 189 has been truncated (by signage if not by AASHTO), as noted in the Routing section above, by the state of Utah. 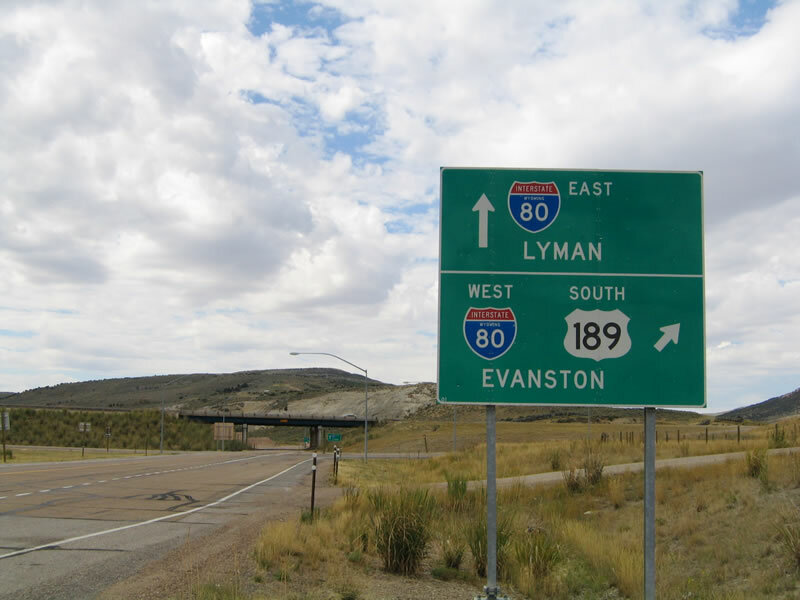 Thus, it has an interesting southern end: U.S. 189 merges with Interstate 80 southeast toward Evanston, then the signage stops at the Utah-Wyoming State Line. It even has a business loop through Evanston, but the route is still signed all the way to the Port of Entry, as shown in this photo. While there may never have been U.S. 189 reassurance shields along mainline Interstate 80 in Utah, it was clear until 1992 how to find U.S. 189 again as one headed southwest on Interstate 80. Until 1992, Utah 32 was signed as U.S. 189. Signs on Interstate 80 Exit 156 (Wanship) clearly directed travelers to take the Utah 32 alignment for southbound U.S. 189. Then in 1992, the Utah Department of Transportation replaced the U.S. 189 signs with Utah 32 signs. 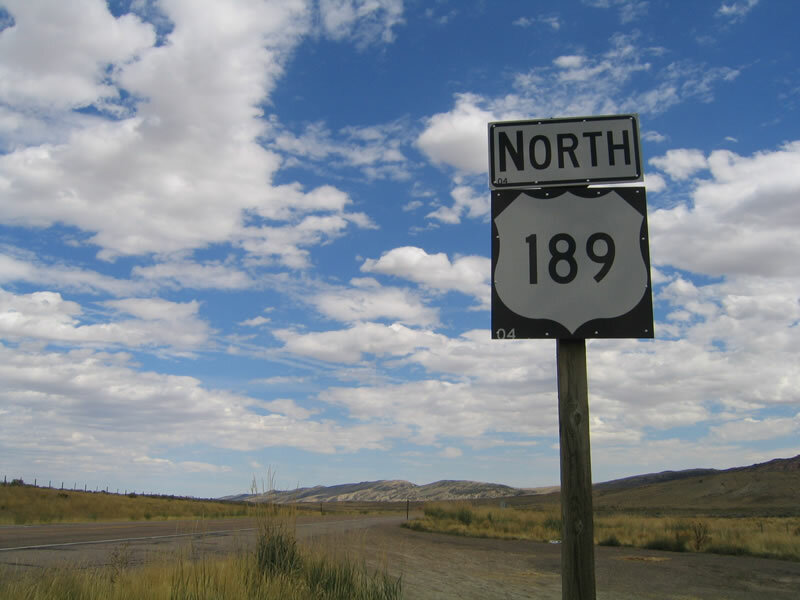 There are no signs for U.S. 189 in Utah off Interstate 80. This is true at the U.S. 40 (Exit 148, Silver Creek Junction), Utah 224 (Exit 145, Park City) or Utah 32 (Exit 156, Wanship) exits. Between 1992 and 1998, orange construction signs along Interstate 80 and U.S. 40 warned travelers that U.S. 189 was under construction through Provo Canyon in Utah, including twin tunnels bored through a rock outcropping just west of the Sundance turnoff. That was the only indication that U.S. 189 continued south of Interstate 80, and those signs are now gone. So in effect, U.S. 189 exists in two sections now, without any sense of connectivity other than the combined stretch with Interstate 80 in Wyoming. U.S. 189 is merged with Interstate 80 for its first 19 miles. It serves the southwestern community of Evanston, then splits from the Interstate at the townsite of Piedmont to head north to Kemmerer. Between Interstate 80 and Kemmerer, U.S. 189 travels the high desert of southwestern Wyoming, enjoying vistas of vast prairie, distant mountains, and rolling, arid hills. The only intersection is Wyoming 412, which links Kemmerer with Mountain View. Kemmerer is the home of the first ever J.C. Penney store; according to Pam Clark, "the Mother Store is still operating. It is located right off the triangle. In the summer, travelers can visit the restored J. C. Penney home located just two blocks from the Mother Store." The town is the seat of Lincoln County. You can usually identify the county seat by looking for each county's major airport on a map. Of course, there are exceptions to this rule. Sweetwater County's airport is located in Rock Springs rather than Green River, even though Green River is the Sweetwater County seat. Northeast of Kemmerer, U.S. 189 travelers will find the Wyoming 240 junction. This is the Diamond Road, made famous for the diamond claims made in the desert along this road. Now, I can't promise that you'll find diamonds along this road, but it still makes for interesting folklore! Heading north to the tiny town of La Barge, U.S. 189 picks up Green River traffic at the Wyoming 372 junction. Some Green River folks argue that the Wyo 372 - U.S. 189 combination is quicker to Jackson than U.S. 191 out of Rock Springs. The traffic tends to be lighter along U.S. 189, because U.S. 191 is a straighter, more direct route for westbound Interstate 80 travelers. 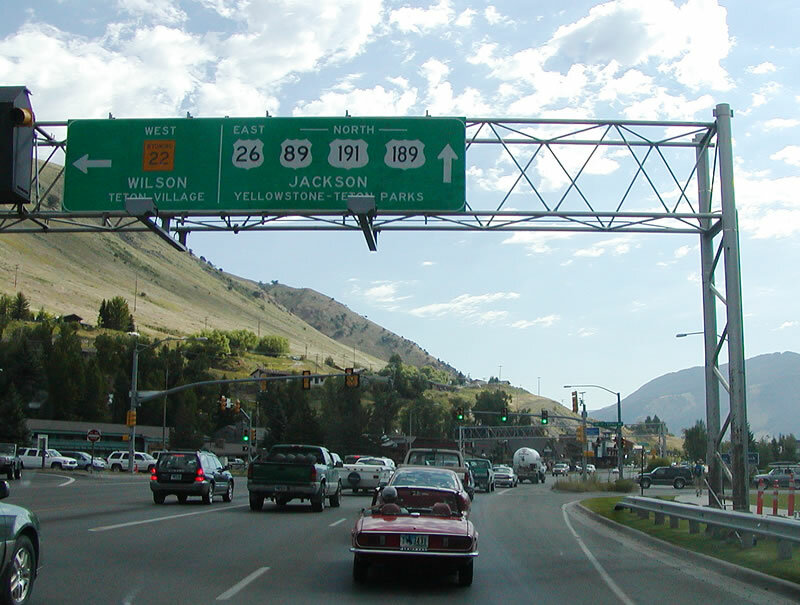 Most Salt Lake City travelers take Interstate 15 north to U.S. 26 to get to Jackson rather than U.S. 189. U.S. 189 then heads due north along the Green River, hitting the twin towns of Marbleton and Big Piney. The cool thing about these towns is that they are only a couple of miles apart. So you have the basic shops, bars, and motels in both towns, then a little mini-mall between the towns. I always laugh when I pass by the gleaming Radio Shack sign that lights up the darkness so well. Big Piney, incidentally, is considered to be one of the coldest spots in the country. U.S. 189 continues along the Green River until it meets U.S. 191 at Daniel Junction. To continue this guide of U.S. 189, go to the U.S. 191 page. U.S. 189 continues north of Hoback Junction to end at the intersection of Cache Street and Broadway in downtown Jackson. An end sign is located one block south of this intersection. Immediately after the Interstate 80 interchange, this is the first northbound reassurance shield for U.S. 189 as it travels toward Kemmerer, Big Piney, and Jackson. This shield is fairly typical of those used for three digit U.S. routes in the state of Wyoming, as the numerals are made a bit smaller so that the numbers can fit in a regular two-digit shield. Photo taken 09/07/05. The extant section of U.S. 189 folds into Interstate 80 between Evanston and Lyman. 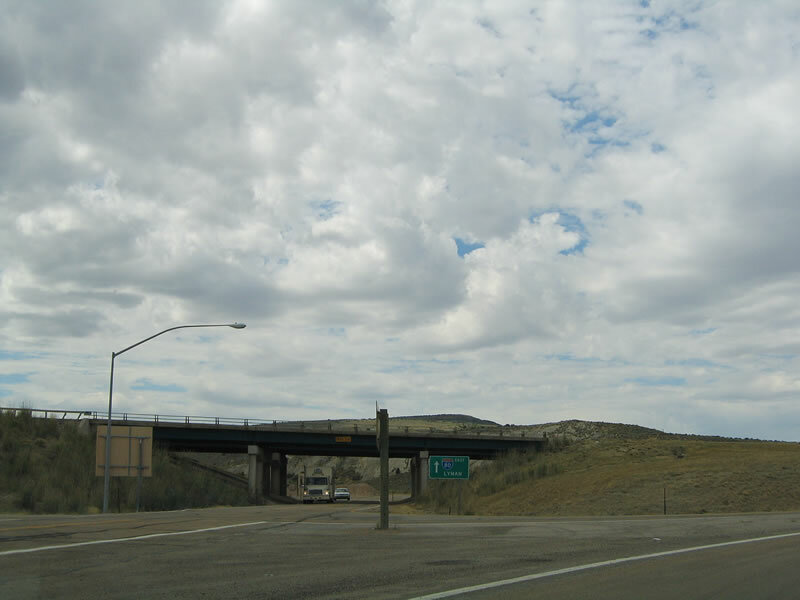 The two routes are fully signed together in Wyoming, but U.S. 189 disappears on its shared alignment with Interstate 80 in Utah. To continue south on U.S. 189 to Provo, follow Interstate 80 west past Evanston into Utah, exiting at the U.S. 40 interchange (Exit 146). U.S. 189 silently merges onto U.S. 40 east, and they split in Heber City. U.S. 189 travels southwest from Heber City through Provo Canyon to end at Interstate 15 in Provo. Photo taken 09/07/05. U.S. 189 south merges onto Interstate 80 west. The mainline of U.S. 189 transitions into a county route that connects to an old stretch of Lincoln Highway (U.S. 30S). Photo taken 09/07/05.